Totally Vocally is packed with music, entertainment, and education! 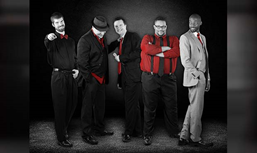 Through contemporary and classic cover songs as well as original works, Ball in the House helps kids discover the history of a cappella singing from chant to doo wop. The elements of teamwork and collaboration are equally highlighted as kids explore how various vocal parts create harmony and beats, working in unison to produce a multi-dimensional piece of music. Registration is not required for this Friends Children’s Series Program. This program is suitable for kids in grades K-5. Everyone is welcome. Please contact Rita Smith at 717-533-6555 ext 3708 with any questions. Attn: Hershey Area Businesses... Get listed on our site! HERSHEY, HERSHEYPARK, HERSHEY THE SWEETEST PLACE ON EARTH, HERSHEY BEARS, ZOOAMERICA and CHOCOLATE TOWN USA are trademarks used with permission. Photos courtesy of Hershey Entertainment & Resorts Company. The Hershey Partnership, Hershey PA Chamber of Commerce. Located in downtown Hershey, providing information as the Official Visitor Center in Hershey.